In accordance with the ASTM E74-13a standard, Morehouse reports the Lower Limit Factor (LLF) which is reported on page one of the calibration certificate and not uncertainty. ASTM E74-06 used to call LLF the uncertainty. The ASTM E74-06 standard was very misleading as the uncertainty reported was only one component of the overall system uncertainty. ASTM E74-13a addressed this issue by changing the term uncertainty to LLF. The LLF is calculated in accordance with section 8 Calculation and Analysis of Data found in ASTM E74-13a and is a Type A uncertainty component. 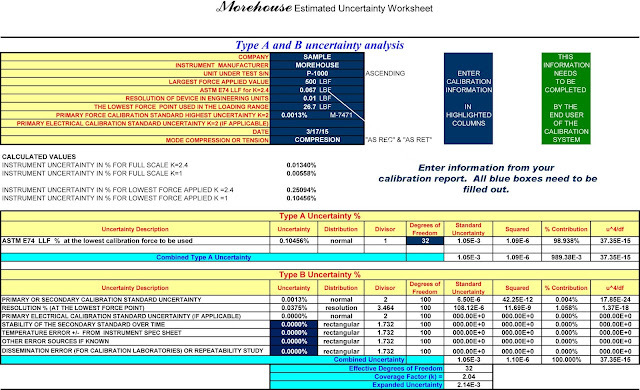 Morehouse has developed a guidance document to help you calculate your uncertainty. This guidance document incorporates suggestions found in the ASTM E74-13a appendix. You can click here to download the excel CMC calculator. Once you open the EXCEL file download provided select the Morehouse Uncertainty Worksheet there is a field to enter the Lower Limit Factor from the calibration certificate. You will be asked to enter additional information that will be found on page #1 and the ASTM data page. The Lower Limit Factor and additional information can then be entered into the spreadsheet as per the example from the download to calculate your measurement uncertainty. The International Laboratory Accreditation Cooperation (ILAC) P-14 section 6.4 requires contributions such as the resolution of the Unit Under Test (UUT) be included in the uncertainty per point value reported on the certificate of calibration. Euramet CG4 v2.0 Uncertainty of Force Measurements also requires the resolution of both the standard and unit under test be reported as standard contributors. The per point analysis consists of the UUT resolution and the CMC of our standard (which will include the resolution of the reference standard if primary standards were not used). When you run a full uncertainty analysis per ILAC P-14 as required by ISO/IEC 17025 guidelines you can then derive your CMC (Calibration and Measurement Capability) which is then reported to your customer, among other things. There is a tab in this spreadsheet to help with calculating your CMC per point. Morehouse can give guidance on using our sheet. It is recommended a professional consultant be contacted if you are having problems figuring out CMC or what to report. We offer training with a focus on measurement uncertainty and an independent consultant two to three times per year. Upcoming training information can be found on our training page. Pull your force calibration data from anywhere using your smartphone.